Back when I was a youngster my parents took my sister and I backpacking all over the Sierras and up and down the California Coast. I can distinctly remember just dipping a water bottle or cup into any river, stream, lake, pond or tarn to get drinking or cooking water without ever having a thought about Giardia or other gastro-intestinal-distress-causing organisms. Sadly, those days are long gone. These days if you do not filter or treat the water you collect in “the wild” you are actively putting your health at risk. No one likes diarrhea, vicious stomach aches, dehydration or any of the other symptoms of giardiasis. To combat the possibility of that happening we have several weapons at our disposal. My old-school MSR MiniWorks water filter has been in my bag for decades and been used at one time or another all over the Western United States. A few years ago I saw a study on Individual Water Purification Devices (IWPDs) to inactivate disease-causing bacteria, viruses, and cysts using UV light and wanted to try that out. It seemed like a good idea to carry this little device instead of the substantially larger MSR filter for when I was trying to keep bulk and weight down to a minimum while backpacking. After several years of use I have come to the conclusion that both devices have their place in our gear. 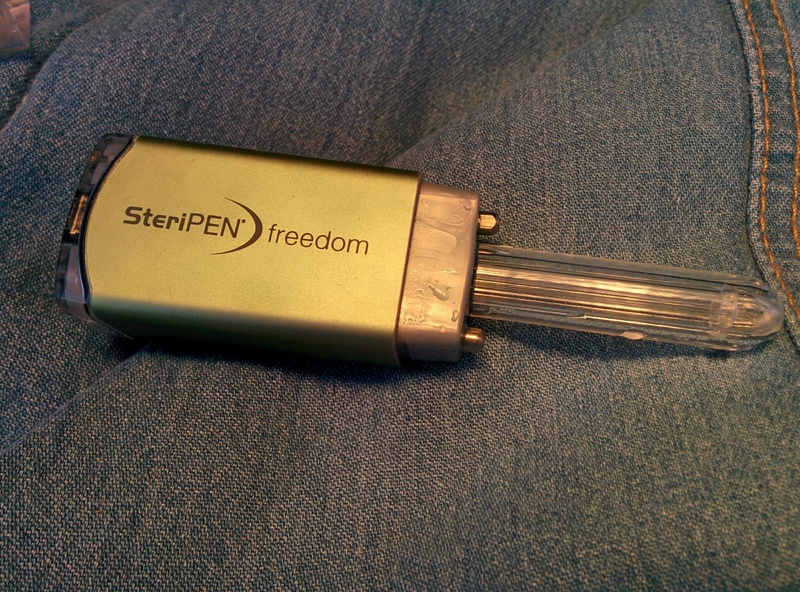 After some research we ended up going to my local REI store and purchasing the SteriPEN Freedom both because we have the capability to charge it via USB and solar and because I wanted it now. Instant gratification makes us happy. We have never performed a rigorous, scientific, double-blind etcetera study on the efficacy of either the MSR filter or the SteriPEN but we have used water collected from some pretty dirty or sketchy sources over the years and have never had any symptoms of giardiasis or the like when using either option. I feel somewhat like a Republican Politician discussing Climate Change, “I am not a scientist but….” My non-scientific understanding of how UV treatment works is that the UV light damages DNA (think skin cancer). A long enough exposure to the right wavelengths will kill or at least damage bacteriological or viral organisms so that they cannot reproduce. It is the reproduction of the organisms in your nice, warm, nutrient-rich stomach and gut that causes those highly undesirable symptoms. Dead is better but, at the very least, if we can stop the reproduction of say, 10,000 organisms from quickly becoming 10 Million little critters then that is good enough to keep us (and you) happy and healthy. 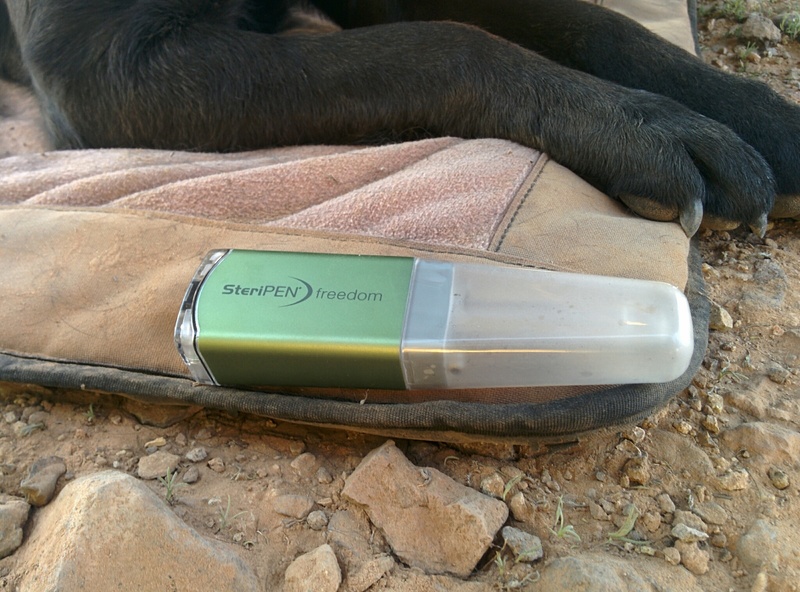 While the SteriPEN works there are a few shortcomings and design issues that keep it from being used as our sole water purifying solution. 1) It is not an actual “filter.” It may make the water safe to consume but does absolutely nothing to remove particulate matter. Sandy, muddy, turbid water stays that way and tastes just like you’d imagine. The MSR filter is an actual filter. Besides removing the little nasties that would do you harm it also makes the water clean, clear and better tasting. 2) Its physical design means that it does not fit in any container with a smaller opening than the area where its two water contacts are. It fits fine in a Nalgene-type bottle but if all you have is a narrow-necked canteen or bottle you are out of luck. 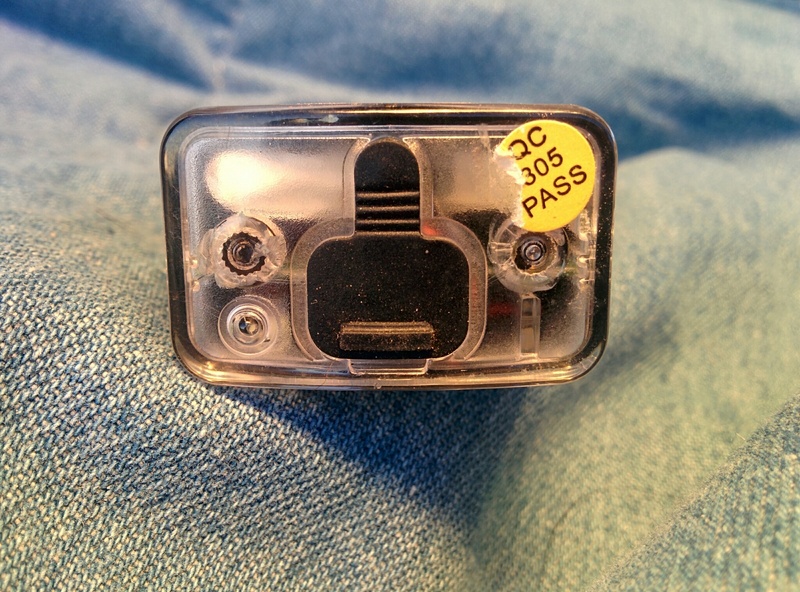 3) For it to work you have to hold it so that those two contacts are both in the water at the same time and they have to remain in contact for the full 48 seconds or else it throws a fault and flashes the red light of shame and you have to try again. If I am only wanting to make two cups of coffee that amount of water in my small pot is not high enough to reach the two contacts unless I hold the SteriPEN at an awkward angle. Then you have to swirl it around during that 48 second window and keeping both of the contacts dipped can be problematic. 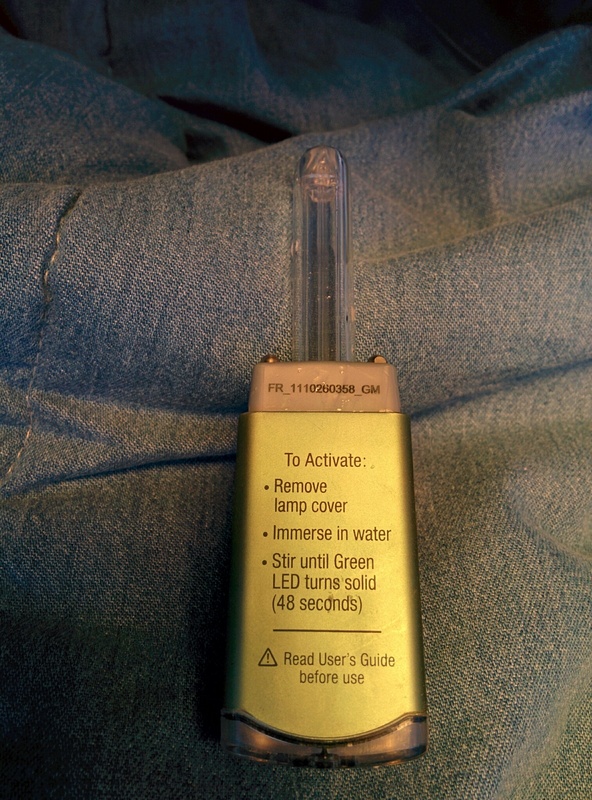 A simple on/off switch with an internal timer and maybe a single water sensor so that it knows if it has remained submerged for the whole disinfection cycle might have been a better option. 4) While it is marketed as water-resistant they really don’t recommend it be fully submerged but, aside from the little rubber plug, it offers no strap or other method of keeping its USB charging port out of harm’s way should it slip from your fingers. 5) The actual UV lamp area is glass. Quartz glass to be sure and supposed to be pretty tough, for glass, but still…glass. 6) No user-replaceable parts. The two main parts I am thinking about are the lamp module and the internal battery. 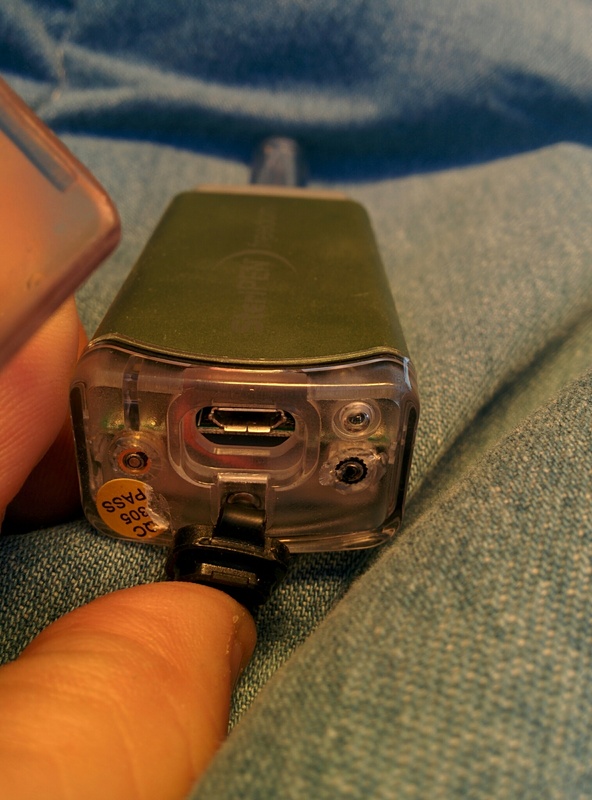 The battery is charged via a micro-USB connector. I personally like that and have several other devices with the same connector and so have numerous micro-USB cables lying all over the place. One is always nearby when the need arises. That being said there is no easy and obvious method for the end-user to replace the internal battery when it inevitably dies. I am pretty geeky and, when that time comes, I might very well attempt to crack open the case and replace the battery myself but the vast majority of people who own this device will just toss it when it stops working. That seems rather short-sighted and wasteful especially when the only thing stopping it from working is a mere battery. The same goes for the lamp. One small drop and the lamp assembly could easily shatter. Over time these types of lamps inevitably lose some of their intensity and will therefore not work as well as they should. 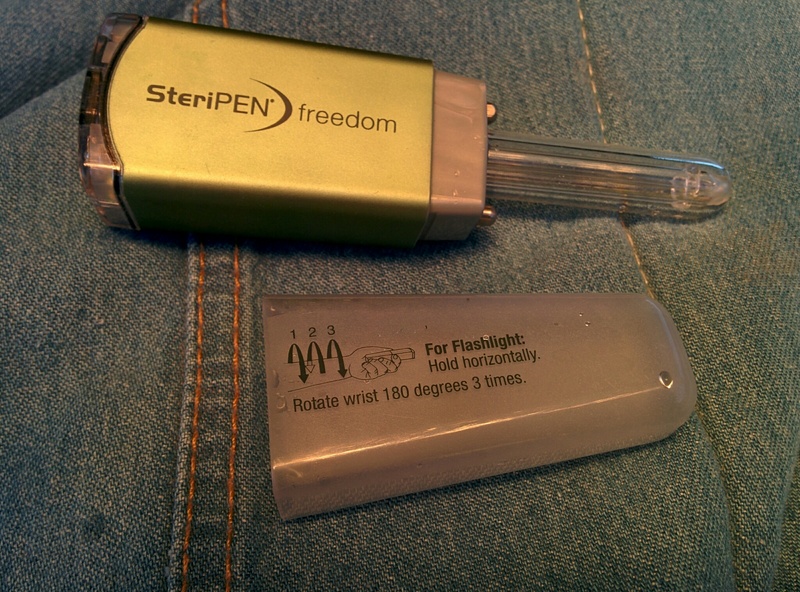 It would be nice to be able to order either part from Hydro-Photon, Inc. (the makers of SteriPEN products) and replace it ourselves but that is seemingly not going to happen. There is a warranty so that you can send the device back to the manufacturer for repair or replacement during the warranty period but I see no mention of repair options after the warranty has expired. I know for a fact that we have collected water that was essentially clear but did have dried chunks of bird feces in it. 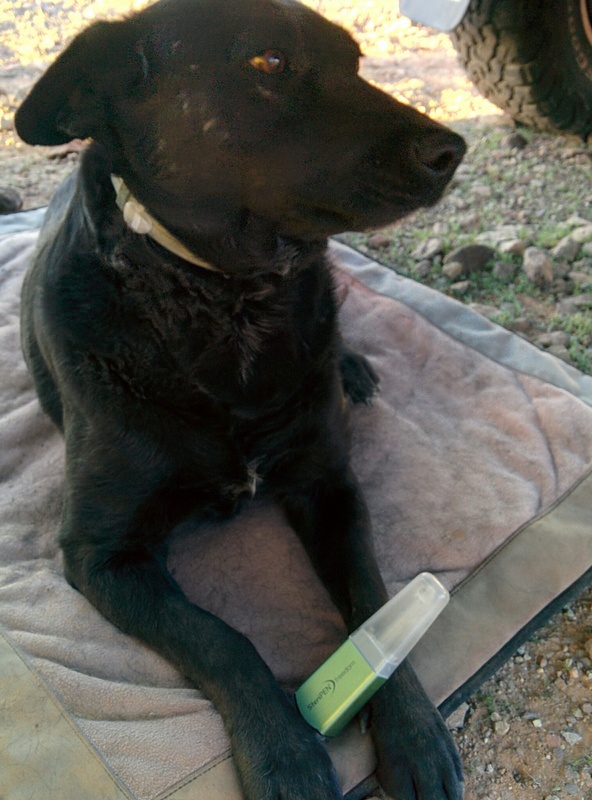 We treated the water with the SteriPEN and then put it through a Brita filter (which does nothing for microorganisms) and neither Willow (or my last dog) or I because sick. We’ve also consumed water that had a couple of dead, rotting bats and other small mammals in it and also stayed healthy as well. 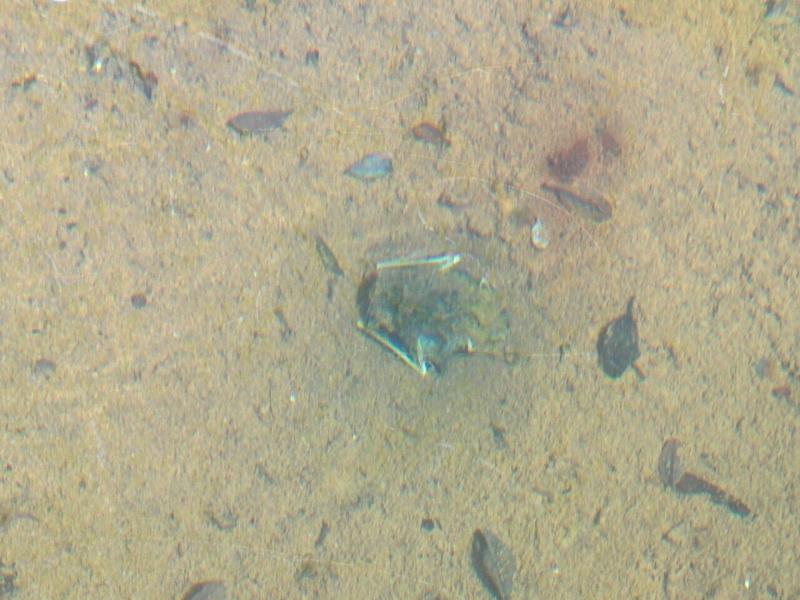 Dead, Rotted Bat in the Bottom of a Water Tank We Used. Yuuummmm. It does though have a few pluses. It is small, lightweight and easily packed. It can be recharged wherever you can get a USB connector via AC, DC or solar. No need to keep buying disposable batteries or keep having to recharge or keep extra sets of Ni-Cad or Li-ion or other type of rechargeable batteries on hand. Water treated via this UV method has no chemical taste or smell as if you were using the chlorine or iodine pill disinfection method.